The guidance is based on published evidence and current best practice in UK medical schools and has been refined through consultation with the Heads of Teachers group in SAPC, the Medical Schools Council (MSC), the General Medical Council (GMC) and the MRCGP Curriculum Development Group. It aims to support implementation of the recommendations of the recent Health Education England (HEE) and the Medical Schools Council 'By choice - not by chance' report on raising the profile of general practice as an intellectually challenging and vocational career choice to medical students at medical schools. It does not propose a one-size-fits-all curriculum or syllabus, but rather a set of guiding principles providing ample space for individual undergraduate programmes to adapt and innovate to their own individual circumstances. 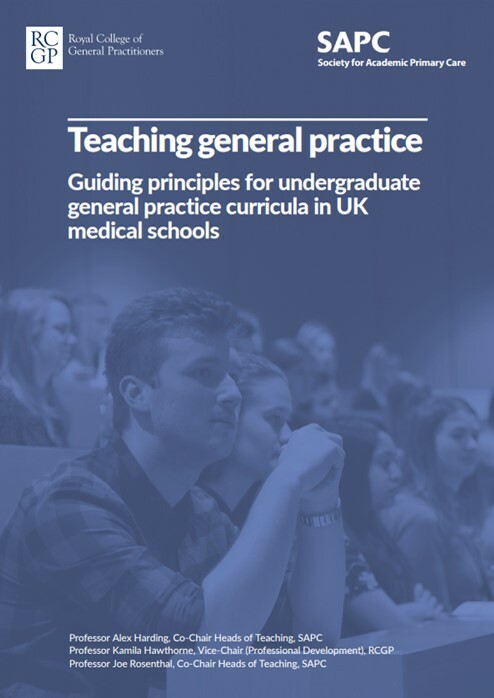 We recommend that medical schools use this document to inform thinking around the quantity, content and process of general practice teaching, both on placements and on campus. This process should integrate with local medical school curricula and also broader GMC curriculum outcomes. Medical schools have a responsibility to educate and prepare approximately half of all their graduates for careers in general practice - this guide shows how best to place emphasis on teaching and promoting general practice as a career which is professionally and intellectually rewarding. It has been consciously aligned to the 'By Choice - not by chance' report which was produced by HEE/MSC in 2016, and is a forward-looking document, describing guiding curriculum principles that will take medical students forward into healthcare for the next decade and beyond. General practice comprises the practical and scholarly aspects of delivering highly effective personalised care to individuals, their families and populations in primary care and community settings. These three areas are enlarged upon in the main body of the document, providing guidance on what medical schools should be considering to deliver as part of their general practice teaching, in more detail. All medical schools should review annually the balance they provide between clinical placements in general practice and in hospital, working towards a goal of delivering a minimum of 25% of their clinical placements in general practice. A significant amount of dedicated general practice academic content should be delivered on medical school campus which should also be reinforced on clinical placements. This teaching should communicate the importance of scholarship, a generalist approach to medicine, and the rich research base of general practice. General practice teaching, both in practice and on campus, should be provided by a range of GPs with different clinical and academic interests in order to demonstrate the breadth and depth of the discipline. All medical school curricula should reflect the recommendations contained within the HEE/MSC 'By choice - not by chance' report on raising the profile of general practice at medical schools.